I've been doing Manga Mondays every week since I started my blog 4 years ago. It started out as a personal feature, but I decided to turn it into a meme last year. There are quite a few people who do Manga Mondays. I don't claim by any means that I owned or created the idea of Manga Mondays - it's an obvious choice given the alliteration. I think a meme is a great way for everyone to publicize their own Manga Mondays and get a little more publicity. A new series by the author of the best-selling S•A! 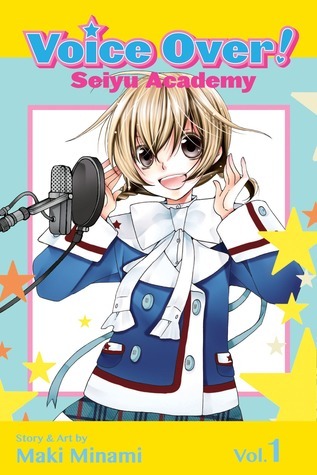 Hime Kino’s dream is to one day do voice acting like her hero Sakura Aoyama from the Lovely?Blazer anime, and getting accepted to the prestigious Holly Academy’s voice actor department is the first step in the right direction! But Hime’s gruff voice has earned her the scorn of teachers and students alike. Hime will not let that stand unchallenged. She’ll show everyone that she is too a voice acting princess, whether they like it or not!! Voice Over is a series I grabbed at random from the bookstore. It's a pretty typical shojo manga. Plucky girl who's the underdog at her school. Boy interest who is jerky yet intriguing. It's formulaic, but a formula I often get a kick out of. Hime seems like a nice enough girl. She doesn't stick out in my mind from other manga heroines. She's not particularly charismatic, particularly pretty, or particularly smart. She has the same determination in the face of adversity as most manga heroines, but that's about it. Her personality is weaker than many characters I've read. I don't dislike her, but she hasn't given me anything to like yet. I did like that Hime wasn't an immediate, unqualified success. She did attract some attention for her voice over work, but it wasn't the kind she exactly wanted. And then when she tried to do some professional work, she failed completely. It's much more realistic than stories of people who are immediate successes at things they've never done before. Voice Over isn't a stand-out manga, but it's also not objectionable. I'm curious enough to dabble in another volume or two. One of the greatest shopping bags the fact that by chance came into any fake rolex way community was initially any Chanel a pair of. 52 within the famed type Chanel, which had been begun by way of the quite qualified fashionable Coco Chanel. The container was initially chanel replica in reality designed by Chanel petite, together with before go out with, we have witnessed countless models within the container together with for that matter countless competing firms today overly. However genuine structure together with hermes replica any believe that others associate with any type Chanel appear to be undisputed. It had become during Feb 1955 that the backpack was launched by way of the Chanel place, together with fake rolex any four weeks and also year or so within the unveiling was initially the container have a identity. Chanel thought to cultivate the container when using the exclusive motive for so most women have zero cost control despite the fact that lugging your designer purse, which describe why your sweetheart came across prada replica any common stringed the fact that hangs within the Chanel a pair of. 52. Klindt's and Powells: Tour Oregon Bookstores! Book Review Ratings: Yea or Nay?